Preface. Acknowledgements. Physical Oceanography. Forcing Functions and Responses. Hydrodynamic Equations of the Sea. Thermodynamics and Energy Relations. Geophysical Fluid Dynamics I. Waves and Tides. Geophysical Fluid Dynamics II. Currents and Circulation. Acoustical Oceanography. Electromagnetics and the Sea. Optics of the Sea. Fundamental Physical Constants. Astronomical and Geodetic Parameters. Representative Values for Oceanic and Atmospheric Parameters. Electrical Parameters. Dimensionless Numbers for Fluids. Index. In recent years, significant advances in both the theoretical and observational sides of physical oceanography have allowed the ocean's physical behavior to be described more quantitatively. 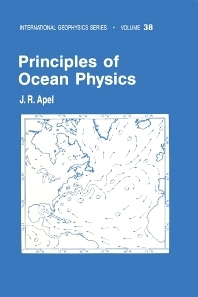 This book discusses the physical mechanisms and processes of the sea, and will be valuable not only to oceanographers but also physicists, graduate students, and scientists working in dynamics or optics of the marine environment. Physicists, graduate students, and scientists from allied disciplines working on specific aspects of the marine environment such as dynamics or optics.